In today’s world of technology, one huge advantage that all travelers have now is the ability to automate and control certain features in your house while you are away. It’s pretty impressive when you can control your house from a smartphone. Now you can control the temperature, lock and unlock doors, turn on the lights, even vacuum the house when you are not home. Some of the things you can do to automate your house when traveling may sound odd but more people are turning to smart home technology and absolutely love the peace of mind and convenience it offers. In order to take advantage of this great smart home technology, we need some gadgets to make it all happen. So in this post, I will show you 6 smart gadgets to automate your home when traveling. If you are anything like me, you loved watching TV shows and movies like The Jetsons or Back to the Future. The (then) quirky gadgets and innovative technologies so naturally incorporated in everyday life were, of course, part of the appeal. Today we know many of these actually held a rather prophetic character and are now part of our daily lives from video chats to houses responding to voice commands. As we keep developing new technologies, we aim to focus on matters relating to safety as well as making our lives easier. We see the desire for automation and security pop up in everything and when we consider SMART Home Technology, we can clearly see how some technologies initially designed to secure and surveille the public realm, are now creating a greater variety in devices and tools suited for private use in order to automate our homes. SMART (Self-Monitoring Analysis and Reporting Technology) Home Technology might still be finding its stability but the growing demand has brought forth many new products. 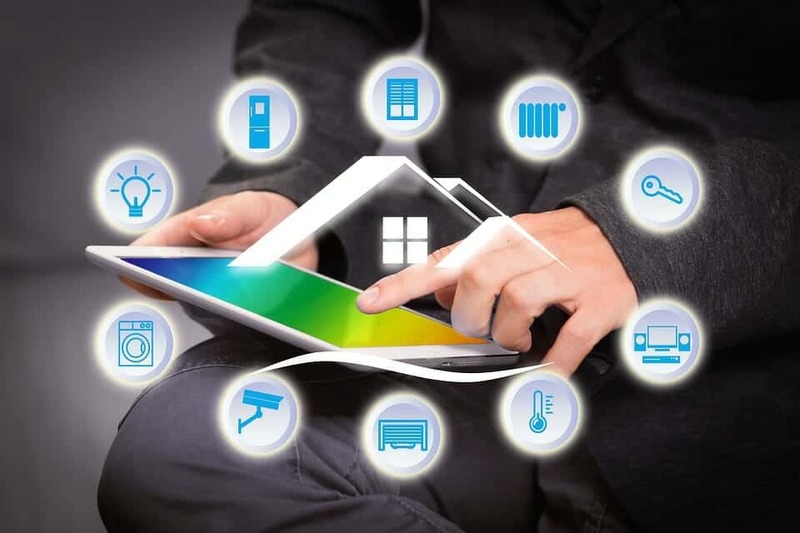 SMART Home Technology equips our houses with automated devices connected to the internet of things that we can use to monitor our home remotely from our smartphones or other network devices. But before you start selecting which devices you would like to place around your home, you first have to decide on which ecosystem and hub would best suit your needs to then connect the desired devices to them. Let us briefly introduce you to this principle before moving on to which devices are essential for any SMART traveler. Smart Home Technology – Which ecosystem? Right now there are three major ecosystems on the market for you to choose from; Amazon Alexa, Apple HomeKit and Google Assistant. For a lot of people, these choices depend on certain technological preferences or habits they have developed already. For instance, iPhone users will find that Apple HomeKit is designed to communicate with their phone most effectively where Android users will prefer working with Google Assistant and Amazon Alexa can actually benefit Amazon Prime users the most. As all ecosystems have their positive and negative sides, it is up to you to decide which ones best suit your current lifestyle. Once you found a system to fit your needs, your next step is to look for a suitable hub. The hub will be essential in connecting all the devices in your house. Google, Amazon as well as Apple all offer hubs. The Google Home Hub offers you a midrange budget device with a perfectly decent user experience but comes less recommended than the Second Generation Echo Show by Amazon. The Apple Home Pod is a bit more expensive. If you don’t have a hub and don’t want to invest in one either, we will also offer you options where the purchase of a hub won’t be required. If you want to learn more about which hub is best for you, check out this article on Tom’s Guide. It offers you a comprehensive and updated overview of the hubs available on the market, all reviewed and tested. Next, to an overview of which hub is available for each ecosystem, you can also find information on the highest rated hub as well as the cheapest option for budget shoppers. There are a large number of devices available and if you so desire, you can make the automated routines fit around your life entirely from the time you wake to the time you go and automate almost every mundane task taking up time in your daily routine. But for this article, we will focus on those devices of importance when you leave your home unattended for a longer period of time. The ability to control your lights from a distance can be used for practical reasons and safety both. For one, forgetting to turn off your light will no longer need to reflect in a disastrous electric bill. But some people even prefer to use this technology to sometimes create the illusion of someone being present in the house by turning on the lights now and then. There are some interesting choices on every end of the budget including options that connect to Wi-Fi directly (no hub required) and various starter kit products that are perfect when you are shopping on a smaller budget. A nice example of a bulb with no need of a hub and some flashy functions is the LIFX (A19) Wi-Fi Smart Led Light Bulb. It is suitable for all the ecosystems and has a wide variety of colors available for you to choose from. There are many options offered by this bulb for a great price. If you aren’t overly fussed about having the best quality out there and hundreds of color options, there are certainly some other budget options available as well. The Kasa Smart Wi-Fi Led also works without a hub and you get 3 bulbs. This bulb is compatible with Google and Alexa ecosystems. For compatibility with the same systems but for a bulb that does require hub, check out the Sengled Element Basic Smart LED for a very well received budget option coming at $31.61 for 2 bulbs and starter kit. As you can see, it is easier to find items compatible with Alexa and Google than it is for Apple, but here too you can find budget options with starter kit as well as more advanced functions when you visit the Apple accessory shop. There are two major benefits in using a SMART lock when traveling. Firstly there is the fact that keys are amongst the items we lose the most. 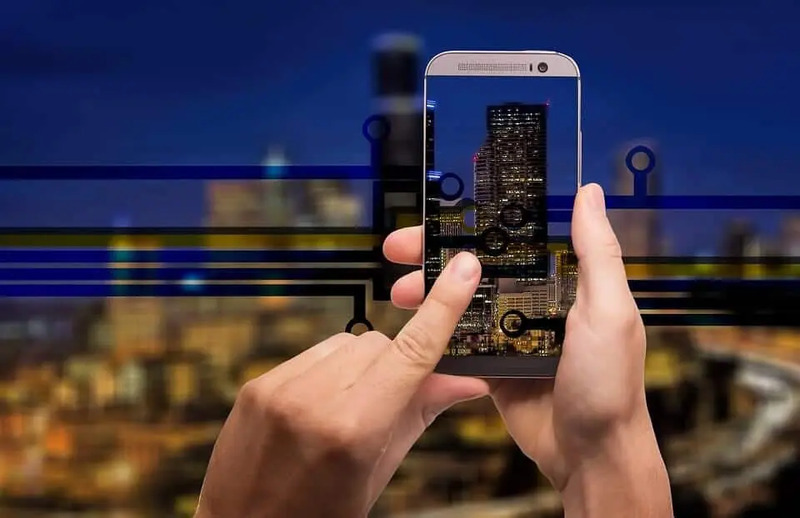 To avoid the frustrations of losing your keys while traveling and so locking yourself out, you can use your smartphone application to control all your locks. Next, to that, there is the matter of being able to use tracking software and so possessing higher levels of security even when you are traveling. SMART locks allow you to link a unique access code so you can track who enters your house and from where. If you are curious about which locks are the best options for you, you can consult the PC Mag list of the best SMART locks of 2018. Whether it is through water leaks or a fire, the last thing you would want is to return to a house which has been damaged in your absence. There are many sensors on the market but we would recommend the multi-purpose Notion all in one SMART home monitoring system. Doors, water leaks, temperature, and a smoke detector are all included in this wireless device which also offers a Get Instant Plumber Matching With Home Advisor function. As soon as anything out of the ordinary is detected, you will receive a message on your phone immediately. If you are looking for cameras in order to surveil your house from the inside, outside or both, you have some amazing options on the market. If you are just looking for a camera to use indoors, make sure to check out the Arlo Technologies Q by Netgear for high performance in day and night picture quality as well as superior motion detection. This camera is compatible with Alexa and Google ecosystems. But don’t worry. If you are an Apple user, you also have the option of using the Circle 2 camera by Logitec for use inside as well as outside of the home, compatible with all ecosystems. The above-mentioned devices are really the ones you want to use for essential security measures to be taken but depending on your needs, you can automate your home to the degree you want. Speaking of cameras, did you know there are those that can help you keep an eye on and even interact with your pet? Of course, we would really only recommend you use these for shorter trips. For the longer ones, it would best to leave your pet with friends or family so they can enjoy actual human contact. Or even take them with you? If you don’t want the hassle of cleaning when you return home, you can control a remotely automated vacuum cleaner during your travels or right before you return home so you are welcomed back into a clean house. Perhaps a simple locking system is not what you want and you would rather have a more personal interaction with your visitors, then you can choose to select a video doorbell. Even when traveling, this SMART gadget allows you to speak with anyone arriving at your door even when you are traveling! The Nest Learning Thermostat uses smart learning technology, allowing you to set your preferred temperature and Nest will learn what you like and automatically adjust itself to your comfort level. Save energy and money with Nest. While you are traveling there is no need to pay for extra heating costs. Use your smartphone to control and automate the temperature. The Nest learning thermostat will pay for itself over time as studies show that it saved an average of 10-12% on heating bills and 15% on cooling bills. Nest is easy to setup and use. All you need is a wifi connection and will work with any phone or tablet with ios 8 or later, or Android 4 or later. Also works with Alexa, meaning you can control your temperature with your voice! With the Ring video doorbell, you can answer your door from anywhere. You can stay connected with motion activated alerts, HD video, and 2 way talking. Requires a wifi connection and is easy to install and manage. This is great for travelers as if you are anywhere in the world, you can monitor and even talk to anyone at your door using your smartphone. You can even store videos for up to 60 days using the cloud service. The Ring video doorbell is becoming more popular with travelers as it’s a great way to monitor your home while away. Also compatible with Alexa meaning you can see a video of your front door just by asking! Using wifi technology, the Samsung Powerbot R7070 will navigate and clean your house while you are away. Using an onboard camera and sensor, the Powerbot will avoid obstacles and vacuum as you programmed from your smartphone. It even has a coverage map to show you where it’s cleaned. 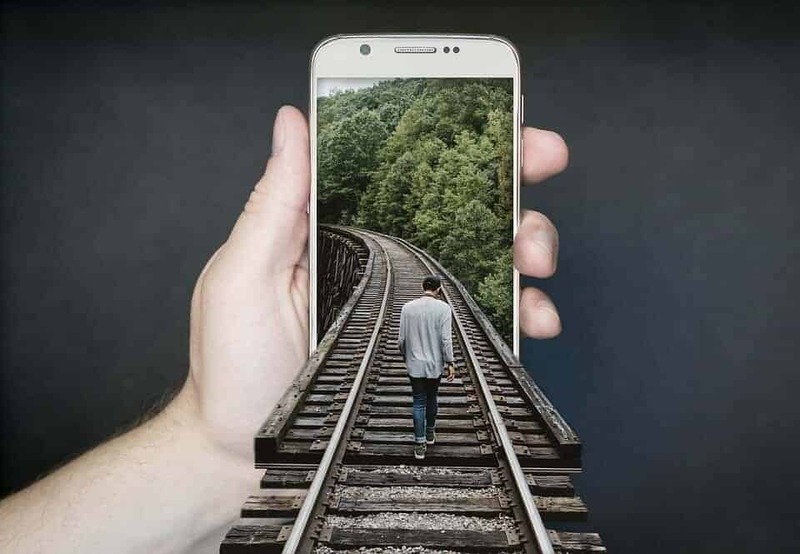 It can also be controlled using Alexa and Google Assistant or be controlled through the Samsung Connect App. This will save you time and effort while you are traveling, just set a program on your device and come home to a clean house! The Wemo Insight smart plug is one of the first things to consider when looking to automate your smart home. Enabled through wifi, this device will allow you to monitor energy consumption and control your lights and electronics from anywhere. You can program and set worry free schedules from your smart device, you won’t need a separate hub or a subscription to do this. Fully controlled from your smartphone, tablet or voice using Alexa. The Amazon Key system is my favorite choice on this list. It is specifically for Amazon Prime members and provides the ultimate in delivery service while you are away traveling. Basically, it is a lock and camera system that will allow you to have full control over your door entry and allow parcel deliveries. No need for spare keys, give friends or family temporary or permanent access. You can give one time access to your electrician to complete work inside your home. You are in full control at all times who has access to your house. Perhaps you are on vacation and want to leave access to a cleaning company or Amazon delivery. If you order something on Amazon’s platform, select Amazon Key App, then shop on Amazon, and select free in-home delivery. It’s that simple. You can even monitor and watch your delivery live or see it later. You will have the option to disable the feature or make adjustments at any time. Also compatible with Alexa so use your voice to control as you like. Eliminate your worries while traveling by using the Nest Protect Smoke and carbon alarm. This alarm system is not like your basic smoke detectors. Don’t worry about those flashing lights, or whether the detector is working or not. It uses a split-spectrum sensor, tests itself automatically and lasts up to a decade. It can send you alerts on your phone if there is a problem and you can silence it right from your phone. It will also detect carbon monoxide as well. It’s very easy to install and requires a wifi connection. You can use it with a smartphone or tablet with ios 8 or later, or Android 4 or later. Plus all Nest products are made to work together. They can even work with lights, locks and other products in your home. It’s no surprise that Alexa is gaining huge popularity in the ever-changing world of technology. More and more people are getting used to using this amazing tool. Think about it, wouldn’t you love to have a personal assistant that took care of things for you when you travel? Things like booking flights, hotels, updated weather conditions and all you had to do is ask? Well, that’s exactly what Alexa can do for you. Plus thousands of other things called “skills”. The list of skills Alexa can do continues to grow constantly. In this post, I will show you all the benefits of having Alexa while you are traveling. Alexa is a personal digital voice assistant created by Amazon. It is built into devices like the Amazon Echo and Echo Dot. The name Alexa was named after the ancient library of Alexandria. Basically, you control Alexa using your voice. Ask it anything to search the web, play music, answer questions and plan your day. With the increasing popularity of smart homes, Alexa can be used to control all of your devices. The standard device Amazon created to use Alexa is the Echo. Now in its second generation, the Echo includes WIFI and Bluetooth technology. The Echo is a great device for home use but I don’t consider it travel sized as there are other options that are smaller and lighter. Price: around $100 but click the link to see the current price on Amazon. Same goes for the Echo Plus which is just an expanded version of the standard Echo. But it does include a built-in smart home hub. Price: Around $150 but click the link to see the current price on Amazon. The Echo Dot is similar to the standard Echo but in a much smaller form. Price: Around $50 but click the link to see the current price on Amazon. The Echo Spot is the first Echo to include a screen and allows for video calling, and watching Amazon Prime videos. You can also use it to watch security systems, baby monitors and more. Price: Around $135 but click the link to see the current price on Amazon. The Echo Show is the upgraded version of the Echo Spot. It includes a bigger screen with better visuals and better sound. It is the most advanced Echo on the list. Most expensive as well. Price: About $230 but click the link to see the current price on Amazon. 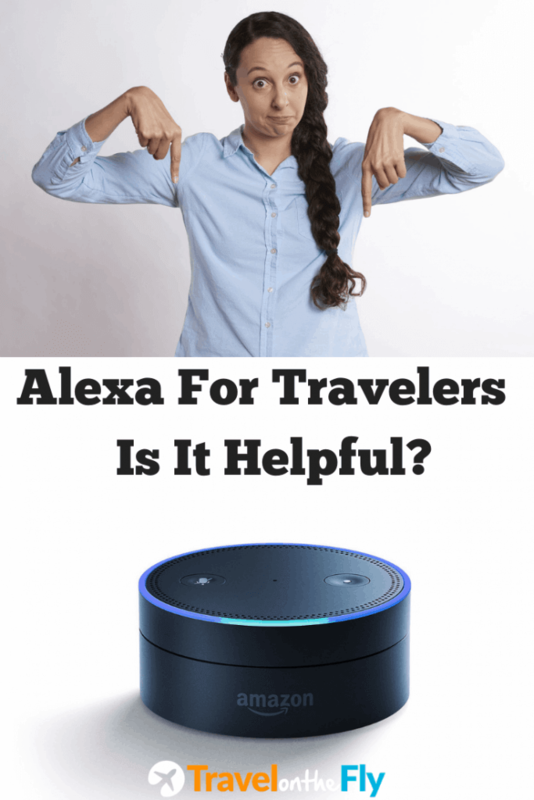 How Is Alexa Useful For Travelers? Ask Alexa to look up flight and hotel information for you. Ask for prices and destinations easily. For example, say “Alexa find my flights for under $500” Check for flight status including delays and updated times. Use Alexa for the latest weather updates on your destinations. Forecasts and real-time weather information can be found instantly. Before setting out on your trip, ask Alexa to book your ground transport at the destination. You can also use the Uber skill to book a ride! This is something I use my Echo Dot for all the time. I love creating lists of things using Alexa. It can create a packing list, shopping list etc.. It really helps to keep things organized and prevent you from forgetting items. Ask Alexa to ” Add headphones to my packing list” Your list will be available on the Alexa app. A very common use of Alexa is the ability to translate languages. Very helpful for picking up words in the country you are in and translating short sentences from English to 37 other languages. Cool tip: Alexa only knows English. You can not speak to it in any other language. If you are traveling in the US or UK, then you can use Alexa to book your seat at dinner time. Using the Open Table skill, simply use your voice to command Alexa and follow the questions to secure your spot. If you are looking for current events in the city you are in, ask Alexa to find it for you. Using the City Guide skill, Alexa can give you information on concerts, theatres, sporting events and much more. Can you travel with Amazon Echo? Yes. You can bring your Amazon Echo with you. I recommend the Echo Dot simply for the lightweight and size, but all Echo’s can tag along with you. All you need is a WIFI connection and power at your destination and you are all set. Alexa Tap is great for travelers. It’s a portable Bluetooth and Wi-Fi enabled speaker giving you a rich, full-range sound. Dual stereo speakers with Dolby processing offer crisp vocals and extended bass response. It’s different from other Bluetooth speakers that only face forward as Amazon Tap has dual stereo speakers that provide immersive, 360-degree omnidirectional audio. When connected to Wi-Fi or a mobile hotspot, just tap the microphone button and ask for music, hear the news, search for information, and more with the Alexa Voice Service. What are the most useful Alexa skills for travelers? If you need a drive, just ask Alexa to book you a lift. Ask: “Alexa, ask Uber to request a ride” and watch as your driver shows up hopefully within minutes. Find out the current status of airport security lines. This will help you plan your arrival time at the airport and avoid missing your flight. Of course, these are just a few of the skills that Alexa can do. You can research online to find the best skills that are better suited to your needs. Alexa and the Amazon Echo are one of many great travel accessories you just gotta have! SMART Homes work for you rather than have you work to maintain them. Take all the above-mentioned tips into account and while traveling, make sure to at least apply the essential devices like lights, monitoring systems, locks, and cameras. After securing these, any further choices you can make according to your own lifestyle. These products are very convenient and will, in one way or another, evolve into an indispensable part of our home, but make sure you still find some level of detachment with your house when traveling and still get the full experience you are setting out to get. So be smart and just use these tools what they are designed for; to make life safer and easier. 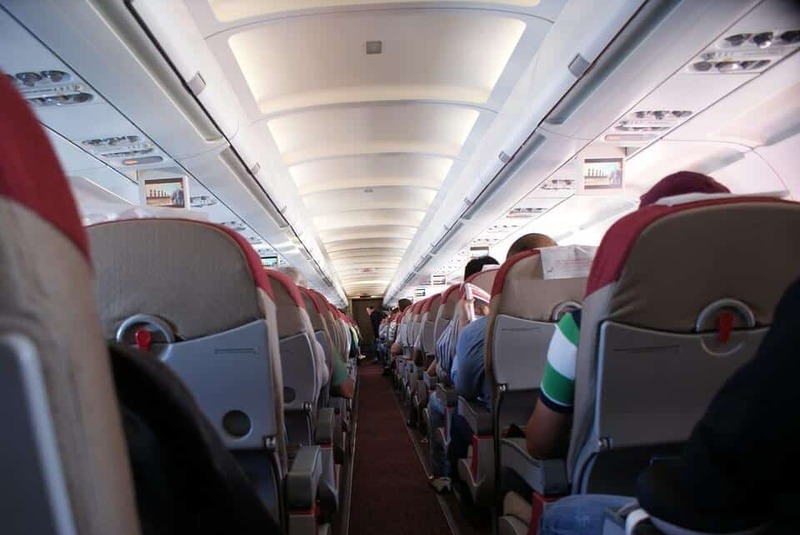 One thing I will say though is peace of mind and worry-free travel goes a long way when you know your home is safe and under your control while you are halfway around the world!